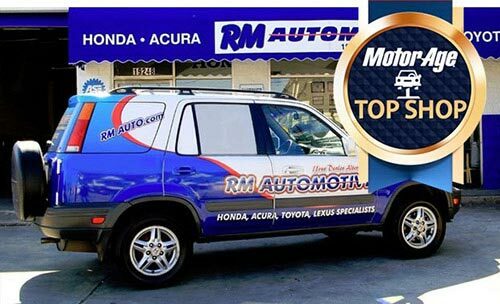 Northridge Auto Repair - RM Automotive Inc.
"Super solid service. Rich tells you what's wrong with the car but doesn't do a hard sell which I like. Easy to make appointments, complimentary drop off and pick up, a nice lobby to wait in. Plus the Office Manager Heidi is really nice! Exactly what I want from my mechanic." 5 STAR REVIEW BY Ilana O. "Best auto repair shop in town. If you are trying to find a a better shop you won't. Owned by the most professional and caring people around mike and reed. Love this place." 5 STAR REVIEW BY Dean W.
Repair specialists in Honda, Acura, Lexus, Toyota, Scion, Nissan, Infiniti, Hyundai, Kia, Subaru and Mazda brands. Complete Automotive Repair and Maintenance Services. We provide everything from quick oil changes to complete engine repair and complex electrical diagnosis. We are proud to be honored by the prestigious automotive trade publication Motor Age Magazine as their Top Shop of 2014! At RM Automotive, we are very confident in our abilities. That’s why we cover all cars that leave our shop with our new and improved “Go Big or Go Home!” 30 Month / 30,000 Mile warranty covering parts and labor. We offer a complete range of automotive maintenance and repair services for Asian Imports including Honda, Acura, Toyota, Lexus, Scion, Nissan, Infiniti, Hyundai, Kia, Subaru and Mazda. Promotional financing for 6 months on purchases of $199 or more made with your Synchrony Car Care credit card.